LEDtronics Inc. introduces a brand new series of DLC-Listed LED Low-Profile Shoeboxes with value like never before. LEDtronics’ SBX series Shoeboxes come with multiple options of mounting accessories: A Slipfitter (with –90-90 degrees adjustability), a swivel mount, and a straight-arm that can mount to a square or round pole. They also have an IP65 safety rating, which makes them suitable for wet locations and excellent HID replacements for outdoor pole/arm-mounted area and roadway lighting, parking lots and structures, building security floodlights, up/down spotlighting, tennis courts, stadiums, tunnels, caves, mines, parks, playgrounds, driveway and walkway lighting as well as construction lighting. These new LED Low-Profile Shoebox Lights are available in a wide range of wattages, from a low output of 24 watts (W) to a high output of 300 W, and replace Metal Halide/HPS fixtures of 100 W up to 1,000 W — energy savings of up to 70 percent. 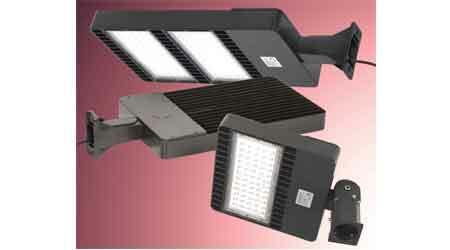 They support input voltages from 100 to 277 VAC, and provide a high-lumen and high-efficacy lighting. The luminaires are offered in three-color temperatures: Warm white (3,000 Kelvin (K)), Natural white (4,000 K) and Pure white (5,000 K). Lumen output ranges from 2,180 to 29,000 lm, depending on wattage/color configuration. The units are constructed with durable, die-cast aluminum housing with a dark-bronze color finish and a polycarbonate clear lens. With a wide operating temperature range of -40-122 degrees, their solid-state construction renders them impervious to shock, vibration, frequent switching and environmental extremes. These LED fixtures are also offered in a higher voltage range, as well as a DC voltage range that is ideal for solar-powered applications! Also available is a photo cell accessory kit and other housing color finishes. LEDtronics’ DLC and ETL-listed LED Shoeboxes come with a five-year U.S. warranty.